The balanced lugsail is one of the cheapest and easiest rigs to set up on a small boat. They can even outperform the modern bermudan sail in certain conditions and points of sail. It is the most popular form of lug sail for small boats as it is powerful, docile and easy to handle. In terms of overall efficiency, a well set up bermudan sail will out perform a well set up and properly trimmed lug sail. However, it is rare indeed to find an average small boat cruiser who does set, trim and sail his bermudan sail efficiently. For the average non racing sailor any differences in sailing efficiency will be barely noticed. What will be noticeable is the reduced cost of the rig, the ease of setting it up and the ease of actually using it. One of the problems with the balanced lug, is having the sail distorted when it is pressed against the mast on one tack, something that the dipping lug overcomes. However the ease of tacking far outweighs any slight loss of efficiency, a loss that the average cruiser will barely notice, to tack a balanced lug merely push the tiller over. The other argument the bermudan aficionados trot out, is its ability to sail closer to the wind but so often these same folk will be the first to get tired of the effort of tacking up a narrow channel and switch on the engine. Once the sheets are eased however the balanced lugsail really begins to prove its worth, down wind they can outperform the bermudan unless it goes to all the bother of hoisting and controlling a spinnaker. What the bermudans don't mention is that the wind close to the surface is slower and less powerful than the wind at the top of the mast. Yet that triangular sail is at its smallest at the top, whereas more traditional, less hi tec rigs such as the balanced lug have plenty of sail area up there where the wind is at it's most free. But I guess that if you have just spent a fortune on a bermudan rig and all its attendant necessary bits you need to find a way of justifying the expense. On "Mignonne" I have elected to use the fully battened Chinese version of the balanced lug. For a dinghy or any smaller boat, a simple' western' balanced lug is probably the better option because of its simplicity. The junk rig may give more control over the sail shape and more bits of string to play with but those extra bits of string do need the extra space on deck and in the cockpit to keep them tidy. Apart from the ease and cheapness of these rigs there are other advantages. Because of the balanced lugsail shape, a given sail area requires a much shorter mast then for a similar bermudan sail area. and a much easier climb to fix mast top fitting on a permanently stepped mast. We tend to describe the balanced lugsail as being 'square' however, strictly speaking most are quadrilaterals, as the opposing edges are rarely parallel. 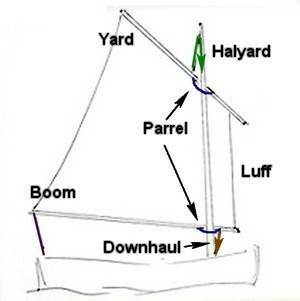 The basic characteristic of all lug sails is that the sail is hung from a yard in such a way that the majority of the sail hangs behind the mast while the leading edge extends forward in front of the mast. The yard is raised and lowered by means of the halyard and is loosely held to the mast by a short length of line known as a 'parrel'. It is normal to find a Lug sail hung from the port side of the mast, this seems to be from convention rather than from any practical reason. With the balanced lugsail the lower edge of the sail is attached to a boom, which also continues forward of the mast to hold the luff of the sail. The boom usually has a parrel holding it to the mast, a controlling sheet at the clew end and most importantly it will have a downhaul at the forward end. The downhaul is used to control the luff tension. While a balanced lugsail mast is usually short and stiff, the yard and boom should have some flexibility, which is another good reason for using wooden spars. A certain amount of flex in the boom and yard will allow the sail to develop some curvature. The amount of hardware/fittings required for a balanced lug will depend on the size of the sail. 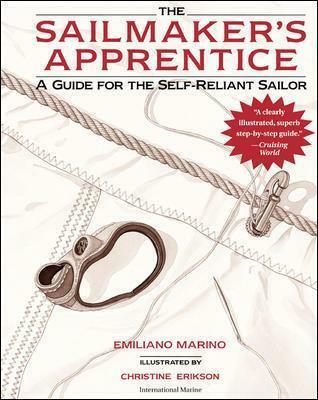 Basically you need a block or sheave at the mast head to take the halyard and somewhere to tie off the halyard. Tackle and rope clutch to control the downhaul. And somewhere to tie off the sheet. Clearly the larger, heaver and more powerful the sail the greater will be the need for extra purchase, especially on the halyard. However, as the forces involved and need to constantly adjust are minimal there is really no need to spend a fortune on hi tec, fancy, 'friction free' blocks. The only concession to hi tec might be the use of low stretch rope for the halyard. It is possible to set up a jiffy reefing system that could be operated from the cockpit or even roller reefing around the boom. But to my mind this will only detract from the beautiful simplicity of the rig. And with every added complication comes the risk stuff going wrong, line tangles extra friction, etc. What could be simpler and less prone to snarl ups that a set of reefing tapes sewn on and ready to tie. One slight complication that might be worth while considering is a combined topping lift / lazy jack to make dropping the sail that bit tidier. The balanced lugsail is one of the best traditional rigs, especially for small boats. It is a rig that is capable of very good performance, however this depends on getting the shape and set up right for your particular boat. The position of the mast and how the spars and control lines are attached will also affect how she performs.